Afraid of Failure in Nursing School…Help! We’ve all heard the horror stories of nursing school and all of the challenges you’ll face. In reality, most of these horror stories are either totally inaccurate, or greatly exaggerated. Nursing school is not terribly hard if you put in the time to study, attend class, etc. Yes, some people fail classes. Yes, some people drop out completely. But this is more likely due to the fact that the person either didn’t put in the time to study, or decided at some point that nursing wasn’t really a good match, and they ditched it out of boredom or some other reason. What people seem to forget is this other fact: Some people graduate from nursing school with flying colors and feel it was an excellent choice to go. That’s why nursing is one of the fastest growing professions, and there are over a million who didn’t think it was that hard. I’d heard so many horror stories about nursing, that by the time I entered nursing school I was almost sick to my stomach. I would constantly fear that I was going to fail, or that I wouldn’t make it. Looking back, however, most all of those fears were not justified. I graduated with honors, never failed a class, and never even made a C (or below). I also studied my tail off, and put in a lot of hours to study things such as tests, study guides, and so forth. I can also probably count on one hand how many classes I missed the entire 4 years. In other words, I put up a lot of effort. Like they old saying goes “You get out what you put into it.” If you enjoy nursing or healthcare, and you are willing to put forth the time and effort, you can succeed and pass (even with honors). 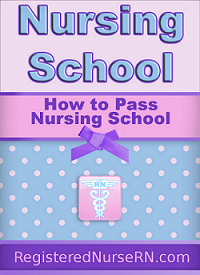 If you slack off, don’t attend class, and don’t study–then nursing school will be incredibly hard, simply because you wouldn’t have learned anything (who can if they don’t study or go to class?). First of all, I would like to say the Q&A and Ive read have been GREAT! I’m very positive that this is the right decision for me to enter nursing school. I’m a Certified Medical Assistant and Phlebotomist, Ive worked as a CNA and currently working as a PCT. So I’m learning new things everyday as I prepare myself for nursing school. However, I’m so afraid….of the lack of understanding, failure, and just the thought of entering and halfway through giving up (so many people I know have done so). So my question is what advice,inspiration, testimony and or tips can u give me to prepare myself for this journey ahead? Dee, thanks so much for your question. I can definitely relate to what you are feeling, and I felt the same thing (as did many of my friends who are now nurses). First let me say this: You have an excellent background to become a nurse. Working as a CNA, PCT, Phlebotomist, etc is absolutely wonderful experience that you can use for nursing school applications, job applications, and more. You probably already have a lot of familiarity with what a nurse actually does on a day-to-day basis, which puts you ahead of a lot of nursing students. And if you were able to successfully do all of those jobs/certifications, you can absolutely become a nurse. In fact, you practically already are one! The fear of failure is there for every pursuit in life. It doesn’t make a difference if it is nursing, accounting, teaching, parenting, or writing, or whatever. We as humans fear failing and feeling worthless. The key, however, is to channel that fear into a productive attitude. Fear of failure can be good or bad. If you allow the fear of failure to consume you, then you’ll dwell on negative thoughts so long that you’ll give up. If you don’t have enough fear of failure, then you won’t take your classes seriously enough and won’t study. So the answer to the fear of failure is to keep in it’s proper place, and channel that energy to help you study more. As you pass more and more classes, and get closer and closer to graduation, you’ll build some confidence and your fears will slowly subside. I do know that the fear of failing tests helped me buckle down and really crank out studying time. And think about it: What’s the worst that can happen? You fail a class? So what… you can always retake it or get a tutor (or speak to the professor) at the first signs of trouble. A lot of wonderful nurses had to retake classes. The thing is, as long as you attend lectures, put in ample time for studying, do your homework, etc–then you have really good odds of passing your classes. Yes, you may have a tough class/professor, but you’ll also have the occasional dog-easy class/professor too, so it kinda balances out. A nursing degree will open up so many doors for you throughout your career. There are so many specialties within nursing, and not only that, but you can also do teaching, consulting, management, and so many other things should you ever get tired and want to move on to other things. Nursing school is a big decision, but there are a lot of good reasons to become a nurse. It is an important decision, and one that shouldn’t be taken lightly. It’s important for you to decide if you are willing to put for the effort and time. I had many similar questions and fears like you, but looking back, I know I made a great decision. I have no regrets, and I’m glad it is over and I can move forward. Whether you decide to attend nursing school or not, I want to wish you the very best of luck. You have some impressive credentials already, and I believe that if you could achieve what you’ve already achieved, you absolutely have what it takes to become a nurse. It may be tough at times, but if you are willing to put in the time and dedication, I think you can succeed! I wish you all the best, and God bless you.